The undisputed headliner of the head section of your Web pages is the Title tag. Although the various search engines out there won’t say how important any one element is in their algorithms, most industry experts agree that the Title tag is one of the most critical. Because the Title tag not only shows up in your browser window but also in the search engine results, it’s easy to infer that this tag naturally has some impact in the search engine’s ranking algorithms. The following code (and the figure) shows you how a Title tag appears in HTML. Getting this tag right has many benefits — increased ranking, branding, and click-throughs. Getting it wrong severely hinders your page’s chances at ranking in the search engine — duplicate Title tags are considered spam and are filtered, poorly written ones won’t garner click-throughs, and your branding purposes won’t be served. Leaving out the keywords hurts your chances to rank for those words. The Title tag, although short, tells the search engine what your page is about. The maximum number of characters allotted for the Title tag is 62 to 70, depending upon the search engine. You have just a few words to inform, entice, and reinforce your brand to search engines and their users. In order to get your message through, you need to be specific with keywords. Entice searchers with calls to action and use “research” words like how to and information. The above figure displays a Title tag as seen in Google’s search engine results pages. Focus. Your page must have a single explicit subject. Put keywords related to that focus in the Title. Silo. Your page must support the theme of the page above it and be supported by the pages that link below it. Theme level keywords should appear in the Title. Branding. Some pages are critical to support branding; others are not. If branding is an issue, include branded keywords in the Title. After you’ve decided on your focus, theme, and brand emphasis, you’re ready to start writing your tag. Even though the actual length of your Title tag varies depending on your industry standard, you can follow some basic guidelines to get started. The two most important terms to remember are unique and keyword-rich. You need to make sure that you’re writing unique, keyword-rich titles for your pages. The title of your page should belong only to that page, and not be used anywhere else on your site. If you’re following your focus, theme, and branding guidelines, you should already be using words in a combination that won’t be repeated somewhere else. Your title should not be sensational or contain keywords that you don’t expect to rank for. Be sure that you have only one Title tag per page. Duplicate Title tags are a severe issue that could lead to filtering of your pages by the search engines, denying them the ability to rank for key terms. Your title should be fairly short. Google cuts your title off after 70 characters, so you need to get your message right up front. Although Google indexes the whole tag, you want users to see your relevance immediately. Put the keywords up front, and make them enticing for people to click through. If branding is an issue, put your company name at the end unless that is the main thrust of your SEO strategy. For example, Nike doesn’t put running shoes at the front of their title: They put Nike first because their brand is their most important keyword. 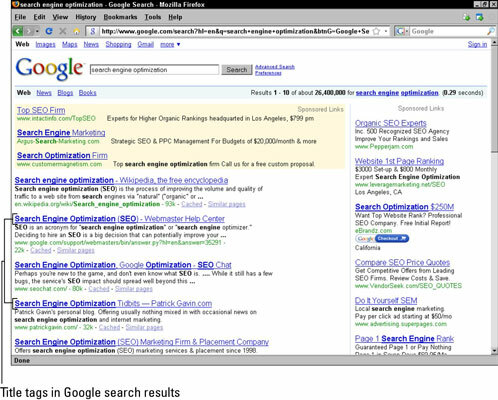 Notice that in the figure, the words search engine optimization is bolded wherever they appear. Google bolds search query words that appear in the title, which may lead to higher click-throughs. Eye-tracking studies have shown that people are naturally drawn to bold-faced type.